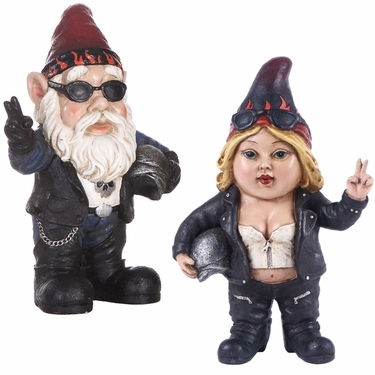 Add a little biker gnome fun to your entryway, garden or flowerbed with our new Gnomad Biker Gnomes Set! This Biker gnome is the complete package with the leather jacket, gloves, helmet, and sunglasses. A chain hangs from his belt and a skull adorns his t-shirt. The back of his jacket is detailed with "GARDEN OUTLAWS GNOMAD" and skull emblem design. His flaming hot girlfriend has the hat with flames to match. The back of her jacket is detailed with "GNOMAD" and skull emblem design. Both have their hands extended with the Peace symbol to all who approach. Imaginatively sculpted, these statues are made of polyresin and are good for both indoor and outdoor use. Biker Size: 7.25"L x 4"W x 10.25"H, Approx. 3 lbs. Babe Size: 6.75"L x 3.5"W x 10.25"H, Approx. 3 lbs.